Summer, always a period of good vibes, is when the only thing you want is just to relax and enjoy life – but this year we were pretty much busy due to the shooting of our own series for Sky TV. This gave us the chance to travel a lot and discover new waters, spending time at the venues and enjoying the beauty and peace. In general, for us, it’s not just about catching big ones, size doesn’t really matter; what is really important for us is the place where the fish are caught. So for this particular five day session, we were looking for a peaceful place where we could catch some hard-fighting carp and have a some fun – and the place we ended up at was Lake Mola in the south of Slovenia, near the border with Croatia. 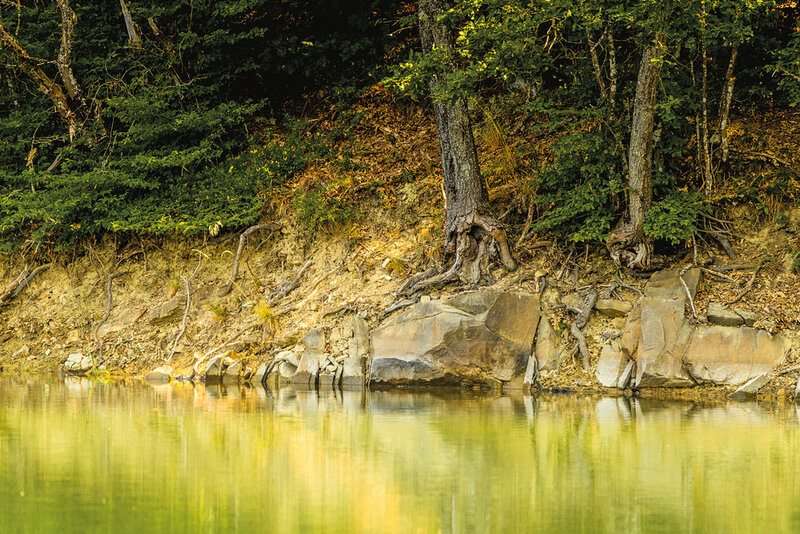 This is a very big reservoir fed by a small creek – it’s shaped like a snake and it offers many different kinds of amazing areas for carp – from a very big bay of shallow water, short sections where you can even cast to the opposite bank, and large areas with deep water, and so on. Arriving at the lake we parked our van next to the cottage of the fishing club, and the scenery in front of us was outstanding. As we had approached the lake it appeared completely free of other anglers – perhaps because it was a Tuesday – so this gave us plenty of choices. Eventually, we ended up in a large peg that was shaded by some overhanging trees. Before long I was out in the boat, and began my ‘research’ looking for likely looking spots in the lake. In front of me there was a very wide area with big rocks on the right side with a depth of about 12 metres. To the left side, at a distance of about 300 metres, the bottom rose to less than one metre. 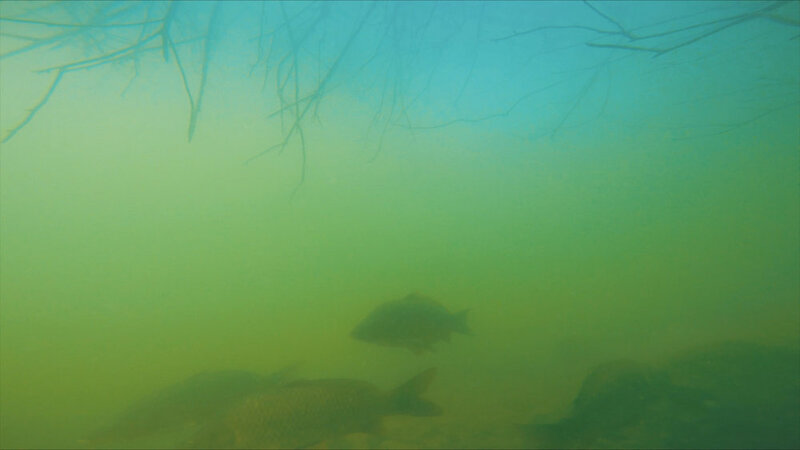 After spending some time watching the water, I could see a lot of action with carp jumping and swimming in shallow water, under some bankside bushes and trees. There were also lots of weedbeds everywhere, and I could see carp swimming in amongst them. However, I decided to fish on one of the clean spots that I’d already found. On the echo sounder there also appeared to be plenty of fish swimming on the bottom, probably carp, possibly feeding already, so I dropped my first marker at a depth of 12 metres, which was likely to be the original river bed. For my second mark I moved a bit closer in to where the bottom looked a bit more weedy, and where it rose up a few metres. As I was drifting along the echo sounder suddenly showed up several fish and, looking over the boat into about five metres of clear water, I could see it was a big group of carp – about 20-25 fish, close together. Guess what? The second marker was dropped there ! I now knew there were lots of carp in the area and this left me in a bit of a dilemma as to the amount of bait to introduce. Clearly, there were plenty of very small carp mixed in with some bigger fish, so the obvious route was to use big diameter baits – hopefully reducing the chances of hooking small carp. I opted for 25lb coated hooklinks – short sections of 30cm – and wide gape size 2 hooks with small rings that would allow the baits to slide, and have a blow out effect. Baits were 16mm pineapple pop-ups above 24mm crab and apple bottom baits. Both the chosen spots are at distances that are easy to reach by casting – one spot is at about 100 metres and the other some 70 metres from the bank. About an hour after casting out, we were having some lunch behind the bivvy when a screaming take made me drop my plate and run to the rods. It turned out to be a double-take, so both Vita and me ended up playing to carp at the same time. It’s very strange how the two carp had picked up the baits at exactly the same time, even though the baits were about 300 metres apart! After a short fight we landed a brace of beautiful mirror carp – not particularly large, but always welcomed as the first action on a new water! We watched the sun disappear behind the forest in front of us, and were a bit surprised that we didn’t get any more takes for a while, considering the number of carp present in the area. Eventually, an hour or so after dark, a very small common managed to swallow my huge bait. It always surprises me how big a bait, even a very small carp can manage to get into its mouth if it really tries. A few small fish fall to our rods during the night and we have to wait till the following morning for a better common that puts up a good fight trying to gain sanctuary in some bushes along the bank to the left. After this fish I decided to introduce some bait and drop my hookbaits in at the same time. The morning slipped by with a few more small fish, and soon it was time for a BBQ in the shade of the trees – the air temperature at this point was 33ºC. As the day passed we had plenty of runs, but with them mostly being small fish it became a bit repetitive and boring. To be fair, as I’ve already mentioned, the area we were fishing is not renowned for big fish but I had expected something a little bigger in amongst the number we had caught. Sure, we were catching plenty of carp and having plenty of fun, and they were all pristine, with quite a few around 12lb to 15lb which was the aim of the trip to be fair. On the fourth night we decided not to fish and, instead, get some sleep. We had all the gear to pack up the next morning and a long journey in front of us. As we began packing up, it started to turn cloudy and it was clear that a big storm was on the way – fast. We started to rush and, with the bivvies, bedchairs and other bigger stuff already packed up and in the back of the van, the inevitable run came as the bite alarmed screamed. To put a fitting end to our trip it turned out to be our biggest fish, a perfect common of just under 20lb. We had managed to tally up over 30 carp in four days fishing – so it was mission accomplished for the filming. Our aim was to capture the fun of carping and show lots of action, no matter the size of the fish, and I think we managed to achieved that.